As Spring has officially arrived (though the weather is back to feeling like winter around here), I have the first of 3 Spring themed kits that will be arriving in my shop over the next week. Haiku Garden will be arriving on March 23, and Haiku Pond will be revealed on March 26. Also, if you haven't grabbed the current Facebook Freebie, hop over to the Foosa Moon facebook page and snag it before it's gone. I have a new freebie I will be posting that coordinates with the Haiku Collection! And finally, the AODD2 blog hop will be kicking off on March 29. 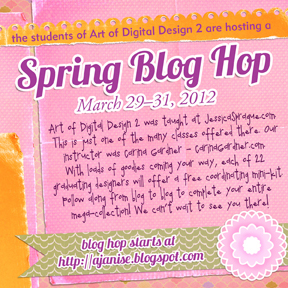 I have my hop goodies all zipped up and ready to go, and am excited to see what the other participants have created!